Hello Everyone. This is Tammy here and I have a new challenge for you. I needed to create something really special for my Grandparents 70th wedding anniversary. For a 70th anniversary you are supposed to give platinum. The first thing I did was pull out this silver and black paper that I just love. It doesn't say platinum on it, but I figures the muted silver was close enough. Then I cut the double hearts, shadow and numbers from my Pazzle. I just had to add a little bling to the side of the hearts. I flipped the paper over and embossed it to add a little more texture. I used silver powder and heat embossed the words to really make them stand out. Here's the finished card. The grandparents loved it and we had a really nice time helping them celebrate there wonderful day. Now it's your turn to create a project using SILVER, BLACK AND WHITE. You can add your project by using the inlinkz tool below, and if you don't have a blog you can upload your project to our flickr group. Please link back to this post and show us a little love by becomng a follower. This challenge is just for fun and will run until March 5. Thanks for playing with us, I can't wait to see what you make. Winner for the Anything Goes Challenge!!! Hope you are having lots of fun creating amazing projects, because we want to see them all. So this week brings us another new sponsor ~ such an exciting year for us here at Crafting By Designs! This week, I am please to welcome Delicious Doodles on board as our sponsor. Teri is the owner and designer at Delicious Doodles, in the store you can find the most amazing array of images, from sweet girls to gothic vampires, beautiful flowers and gorgeous digi papers. I am using Butterfly Border, this image is available in the store. The message is from Faith Sisters. This challenge will be open until February 26; we will select a winner from all the entries. Hello my crafty friends. Sharon here. I'm hoping this challenge "challenges" you to come play with us. Rarely do I beautify the inside of my cards, maybe just a little border sometimes. I'm ready for Spring and who wouldn't like to receive a special card in the mail only to open it to a surprise pop-up of Tulips? I know I would. We're focusing on the inside of the card, but please show us the outside too. 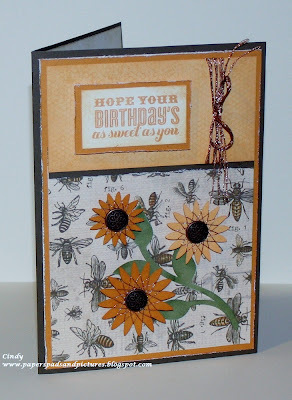 The challenge today is to create the inside of your card by using a Cricut Cut or a Die Cut. I used the Walk in My Garden cartridge. I chose the border option and cut the Tulips x 2 at 1-3/4" and cut the flower pot at 1-1/4". Ok, your turn - show us your Inside Out Card! 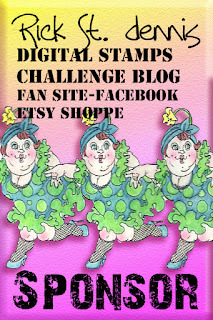 This challenge is just for fun and will be open until Sunday February 24. You can add your project by using the inlinkz tool below, and if you don't have your own blog, you can add your project to our flickr group HERE to link below. Please be sure to add a link back to this post and show us some love by becoming a follower. I hope you decide to play along with us, I can't wait to see what you come up with! Clean and simple is my "go-to" style, and this card took me less than 5 minutes to make. 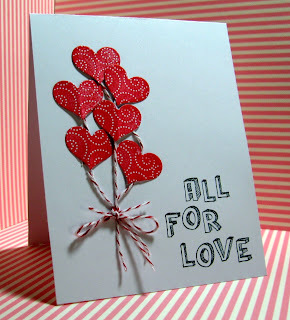 I started with a white cardstock base and cut 6 hearts from white cardstock using the a.muse Heart Trio die set. 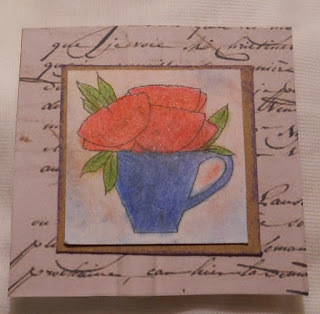 I used some red ink on one of the heart stamps from the All My Heart stamp set, then scored each heart down the middle to give them some dimension. Using some red and white bakers twine, I attached the hearts and string to the card base with some glue dots and added a sentiment from the a.muse All For Love stamp set. Boom - an anniversary card done in five minutes! To check out all these a.muse studio products go HERE. Ok, your turn - show us your hearts! 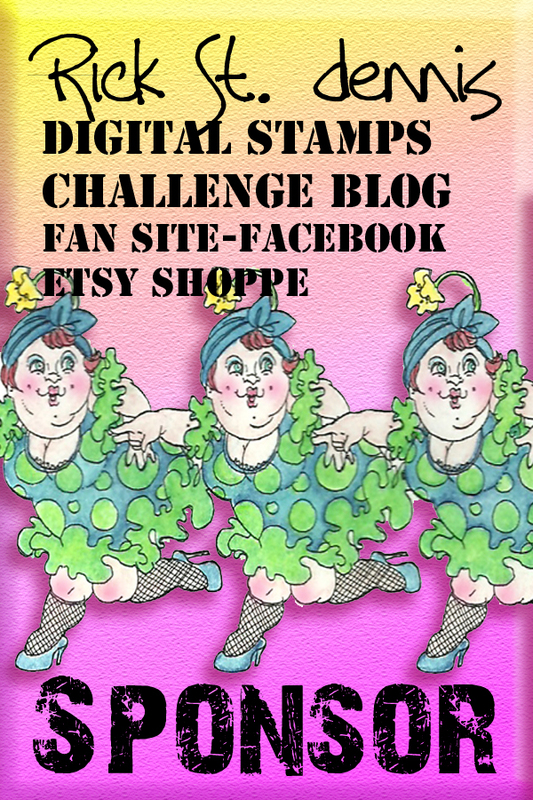 This challenge is just for fun and will be open until Tuesday February 19. You can add your link below using the inlinkz tool and if you don't have a blog you can add your project to our flickr group HERE. Be sure to link your project back here and thanks for playing along with us! Good Morning Everyone! This is Cindy and I love to try new techniques and I love doing challenges. Home Decor and 3D items are all the rage. 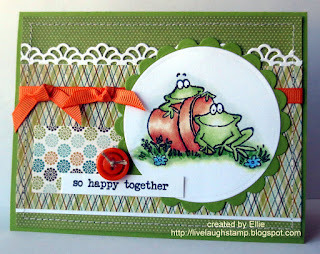 Today, I have a great new technique for you that is just perfect for these projects along with cards and scrapbook layouts. It is called "Spirelli." Spirelli is the art of wrapping string around a scalloped shape. 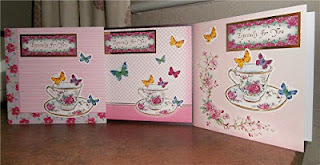 The completed items make great embellishments, flowers and backgrounds. 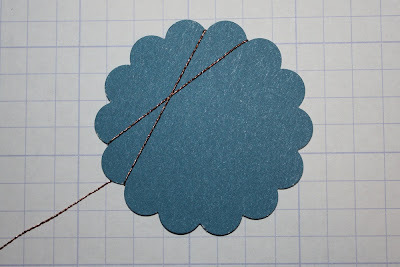 Take a scalloped edge shape. You can punch it, use your dies or Cricut to cut the image. 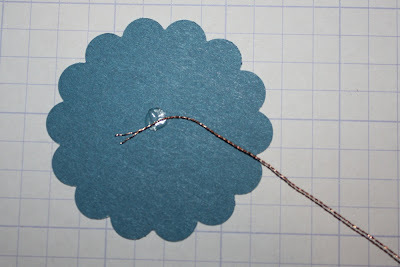 With a glue dot, attach the string to the back. If you are using floss, you might want to separate the ply. Next, begin wrapping the string around the scallops. 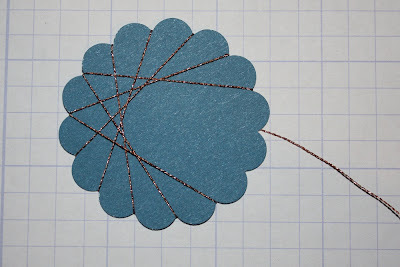 The fewer scallops between your wraps, the larger center of the finished project. For our sample, I chose five scallops. Continue wrapping the floss around the image skipping the same number of scallops with each wrap. Wrap completely around the image. 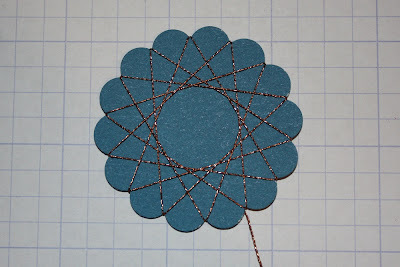 Each scallop will have 2 threads in it. Finish it off by attaching the end of the floss to the glue dot that is holding your starting end. 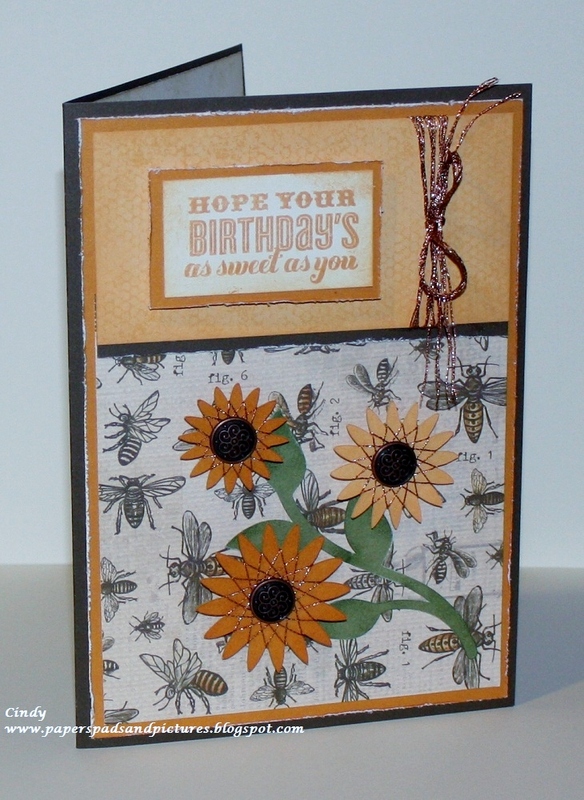 Here is my card again and an up close view of the Spirelli flowers. I used my CTMH Artiste Cricut Cartridge to cut the scallop images and added a larger brad to complete the center. 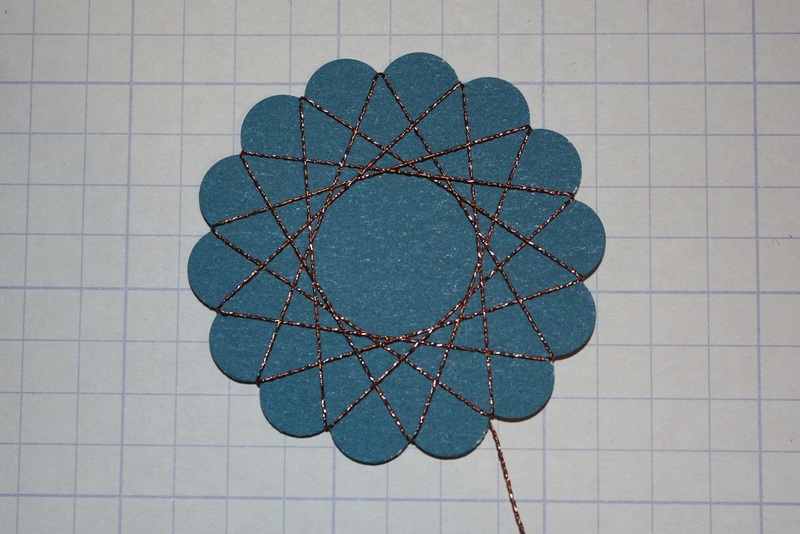 Spirelli makes such a nice addition to any of your projects. I can't wait to see what everyone creates. 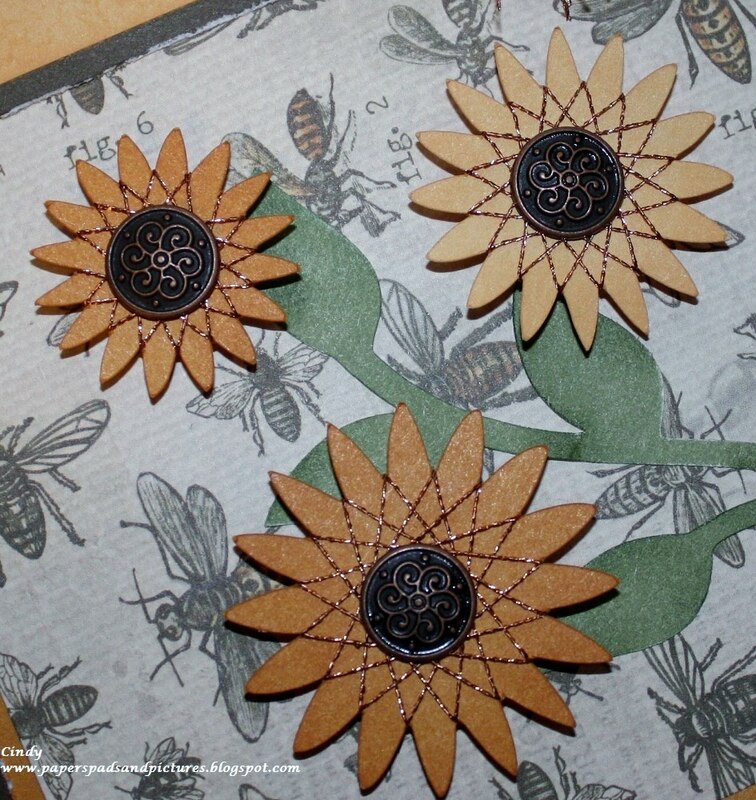 And, as an added bonus, this is Crafting By Designs monthly prize challenge! One randomly selected participant will receive a Close To My Heart (CTMH) goodie package of current and retired product with a retail value of over $35. Link your Home Decor, scrapbook or card projects below. 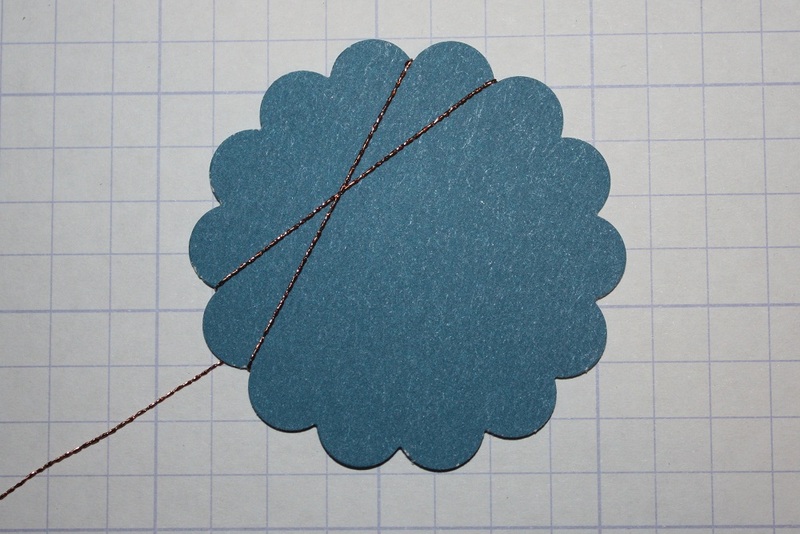 You'll have until February 28th to add your project WHICH MUST INCLUDE AT LEAST ONE EXAMPLE OF THIS SPIRELLI TECHNIQUE. If you don't have a blog you can add your project to our flickr group and link it. Please be sure to link back to CBD and show us a little love by becoming a follower :) For Now, Happy Crafting! Happy February! Good ole Phil DID NOT see his shadow Saturday morning! 'No shadow did he see, means an early spring for you and me.' I don't know about you, but I sure am ready for it. Enough of my babbling, on with the challenge. 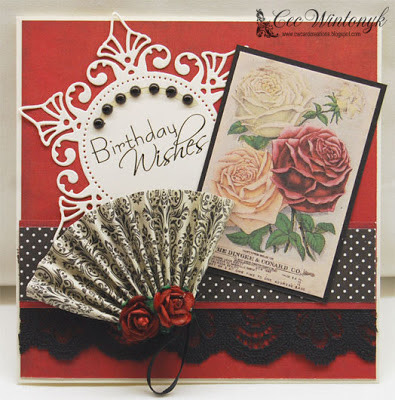 Today I am challenging you to create a CAS (Clean & Simple) card, BUT... I would like for you to use a Sea Creature on your card. Anything that lives in the sea will work. I used a basic white card and colored it lightly with my blending chalks. The little whale was a rub on that I placed on white card stock and cut it, I used a couple of foam squares to raise him slightly from the card for dimension. The heart is from my scrap pile and the waves also came from white card stock in my scrap pile that I wavy cut and colored with chalk. I hope you decide to play along with this challenge. It is for fun only and you can submit your creations through February 10th. Use the inlinkz tool below to link to your blog (and please link back to us) and if you don't have a blog you can add your project to our flickr group HERE. And the Winner Is......Congratulations to all our January winners! Hello my crafty friends. I would like to announce the winner of our Getting Ready for Christmas Challenge, but first I would like to thank each and every one of you who participated in the challenge. January wasn't a good month for my family, I did not get to comment on your entries, but I looked at every single one. The talent that was shared has me totally awestruck! I thought I could pick a winner...but I could not pick just one. 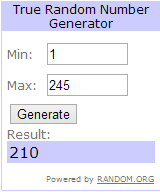 So...I asked my son to pick a number between 1 and 24 (the total number of entries), Danny picked Lucky #9!!! Tina Keller you are our very first winner of the new year! Congratulations!!! Please contact us at: craftingbydesigns@gmail.com In the subject line type: Getting Ready for Christmas Winner. Please send us your mailing information and we will get your fabulous prize from a.muse studio to you right away. And thanks to everyone who played along with us at Crafting by Designs!